Where liquids are greater than 5% of the weight of the mixture. TM Filtration’s KNOCK-OUT POTs are designed for both pressure and vacuum applications. Gas liquid separation is critical to process optimization and equipment protection. Separation of liquid from gas process streams is accomplished with the use of TM Filtration’s Knock-Out Pots. Knock-out Pots also called Knock-out Drums or Flash Drum, are designed to remove bulk liquids and particles from gas streams based on gravitational separation at optimum vapor velocity. The process stream enters the KOP and contacts a deflector to generate a radial flow pattern causing centrifugal separation. 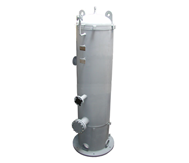 Uses impingement and centrifugal separation to remove liquid and particulates from gas flow. Notes: Body material, connections, available options, and dimensions are completely customizable. Options availability is subject to change without notice. Please consult the TM Sales Department or your local sales representative for certified drawings, or additional information. For applications requiring increased separation efficiency over a Knock-out pot, or when the flow stream contains liquid aerosol mist, TM Filtration’s gas separators are used. The gas separator differs from a KOP by incorporating a second stage separation device such as a mesh pad or vane separator. A Pulsation Dampener is a device used to reduce or eliminate pressure and flow modulations in a piping system which are produced by reciprocating pumps or compressors.